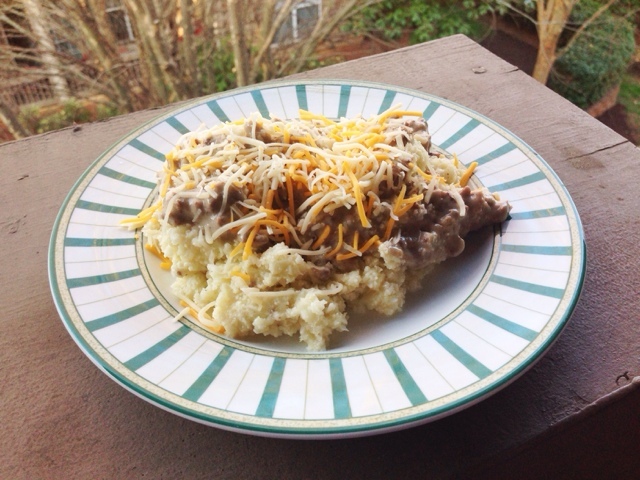 The Clarity Chase: Low-Carb Beef Strogonoff on Cauliflower "Rice"
Low-Carb Beef Strogonoff on Cauliflower "Rice"
Hey guys!! Sorry I've been MIA all week. Work has been absolutely insane for the past two weeks.. by the end of the day all I want to do is go home and face-plant into my bed. And for the most part, that's exactly what I do. However, I did somehow make up a new low-carb recipe (in my zombie-like phase of exhaustion) and it turned out pretty well. I cut up a head of cauliflower and put it through the food processor, as usual, until it was a consistency between rice and mashed potatoes. I emptied the processed cauliflower into a large bowl and placed it in the microwave on regular heat for about 3 minutes. I then took the bowl out of the microwave and mixed in about 1/4 stick of butter until it had melted completely. Then, I browned some ground beef on a skillet and added a little cream cheese and a can of cream of mushroom soup. Once it had cooked completely, I placed the beef mixture on top of a few spoon fulls of my cauliflower "rice". Of course, no dish is complete without cheese.. so I sprinkled some on top. It ended up tasting like beef strogonoff on top of rice. Another successful recipe to add to the books.